When you were a kid, and your mom needed to add a last-minute veggie side dish to dinner, chances are she did one of two things: (a) opened up a can of veggies and boiled them, or (b) opened up some frozen veggies and boiled them. Like most other kids, you probably staged a coup at the dinner table, which most likely ended in tears and/or an empty stomach. Then... you became an adult and realized that Mom was just trying to keep your meals balanced as best she could with a busy schedule. Soon, you found yourself in a similar place - eating dinner at home is healthier and much easier on the wallet, but some nights you're too tired to cook a meal from scratch (even a Slacker Gourmet meal), or you just don't have the right ingredients on hand. In our house, when we have one of those nights, our go-to meal is either chicken sausage or bratwurst, and some kind of frozen seasoned veggie blend. However, since the hubby has some food sensitivities, that narrows the field to about 2 - 3 types of seasoned veggie blends, and we get tired of them pretty quickly. Plus, they've still got a bit more salt and not-entirely-wholesome ingredients than we'd like. So what's a Slacker Gourmet supposed to do? Canned vegetables? NOPE. They're generally loaded up with salt (yes, I know they make no-salt-added varieties), and the texture, even before you cook them, is not quite right. They have a strange, mushy texture and slightly tinny taste. No thank you. Plain frozen vegetables, on the other hand, have the potential to be a blank canvas in the right application. They're completely unseasoned, they're already cut up, it doesn't matter if they're in-season or not, and they've already been blanched before they are frozen (meaning they are partially cooked even before you get your hands on them). However, the cooking directions on the bags always suggest either steaming them in the microwave, or (gulp) boiling them. Can we treat them better? One of my favorite ways to cook fresh vegetables is to roast them. Roasting at a high heat caramelizes the edges, brings out sweetness and nutty flavors, and tames the bitter edge on many vegetables. Of course, this works best on larger, harder veggies like brussels sprouts, potatoes, cauliflower, etc. - not so well on corn (off the cob) or peas, for example. I got to thinking - can we roast frozen vegetables straight from the freezer? The answer: YES! The final texture is slightly different from roasted fresh vegetables, and the cooking time (which is almost completely inactive) is about 40 minutes, but there is barely any prep involved. Most importantly, the flavor of these humble frozen vegetables goes from boiling's "blech!" to "hey, these are pretty good!" They'll never be nearly as amazing as roasted fresh veggies, but they're a good trick to have up your sleeve. I tried roasting frozen cauliflower, Brussels sprouts, crinkle-cut carrots, broccoli and green beans. The Brussels sprouts were the biggest disappointment - they're my absolute favorite roasted fresh vegetable, but their frozen counterparts just didn't have a fantastic flavor. I suspect that they are more sensitive to the blanching and freezing process than other vegetables. The carrots didn't really brown up; they seemed to get a little dry on the outside instead. The flavor really concentrated and got nice and sweet, though. The cauliflower and broccoli were tasty, but the surprise favorite of the bunch were the green beans! They started getting crispy in places and almost tasted like green bean chips. Yum! Preheat oven to 400°F. Line a cookie sheet with aluminum foil for easy cleanup, and put a cooling rack on top of the cookie sheet. I used a cooling rack as the cooking surface to allow air to circulate all around the veggies so any additional water would drain off, and I didn't have to toss them at all during cooking. 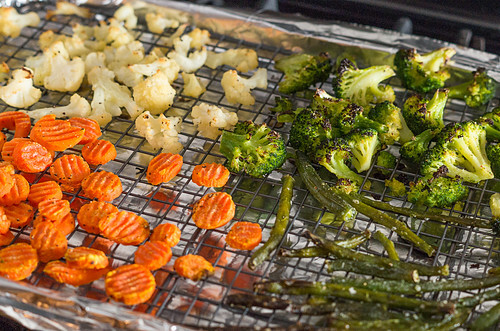 If you don't have a cooling rack, you'll probably want to stir the veggies a couple of times during cooking. 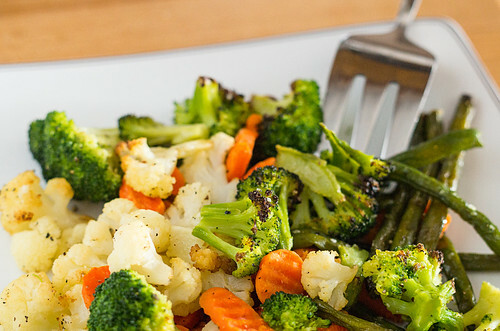 Toss the still-frozen veggies with olive oil, and season generously with salt and pepper. Spread the veggies on the cooling rack, and roast for 10 minutes. Boost the oven temperature to 450°F, and roast veggies for another 30 minutes, or until they are nice and browned around the edges. Enjoy! I personally like my roasted veggies seasoned simply with salt and pepper, but feel free to experiment with different oils and seasonings! A sprinkle of parmesan or Cabot Cheddar Shake at the end would also be great. And if after all this, you try roasting canned vegetables, I really don't want to hear about it. Ew. Thanks for this... sometimes I don't have fresh veggies on hand. Was curious if I could prep ahead for Thanksgiving by freezing my vegetables to be roasted- thanks for your honesty about it not being quite as fabulous! Have you tried Montreal Steak Seasoning on your roasted veggies? Frozen as well as fresh? The brussel sprouts get extra tasty with the montreal steak seasoning. My local grocery store hooked me on roasted brussel sprouts this way. I'm not one to make comments, and I'll absolutely never sign up to make them. However, this completely hit the spot, so I had to say thank you. My mom was indeed the busy mom with balanced meals that sometimes involved boiling veggies (which I just do not care for). And I too am a busy mom just trying to sling something healthy and good on the table. We love roasting anything that will hold still long enough to brown. But as I was thinking about tonight's dinner I realized that we are trying to clean out the freezer and I'm stuck with a stray bag of cauliflower and some frozen green beans. 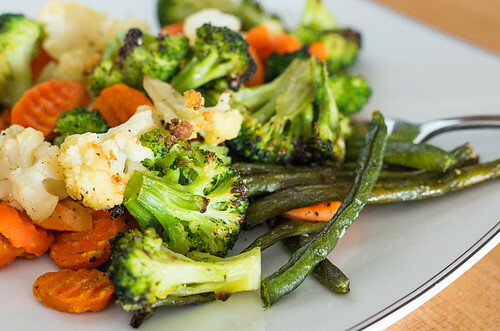 I would never have dreamed to roast frozen veggies, which is why I was so excited to your post. Thanks for the info. I've been avoiding that bag of cauliflower for a couple of months out of dread. Now I'm excited to try your recipe!! PS: We do the steak seasoning thing too and it's great. For brussel sprouts, I recommend balsamic vinegar. It caramelizes too. Yummm. You really should add your website to your printable! I like to know where my recipes come from, so that if I find something fantastic, I can go back there and thank them or look for more, plus refer people there. Looking forward to trying this! Thanks! If you have a Penzey's spice place or buy mail-order from them, their "Mural of Flavor" blend is amazing on otherwise-plain veggies. It also doesn't add more salt. Really delicious and so easy! Thank you. WOW! Best roasted cauliflower I have ever had, Tossed the florets in the bag with EVOO, seasoned them with nothing but ground sea salt, placed the rack an pan in the oven and about 40 minutes later yum yum yum! My friend thought she was eating tater tots. Thank you for the rack idea, I can't wait to use it with other vegetables. OOOOOHHH!!!! EVOO would be totally awesome! I love that dressing! I like to quick marinade the veggies with Garlic Expressions salad dressing and then roast them. It's very tasty! I tried this last night with frozen green beans and broccoli I had lurking in my freezer. Yum!! It was delicious, especially the bits on the edge that got a little brown and crispy. My kids and hubby liked them too. My roasting pan is not very big so I couldn't do very many and for a family of 6, I will need something bigger. You have inspired me to order a cooling/roasting tray with a grid like in your pictures. Thanks for giving me an easy and delicious alternative to steaming our frozen veggies, which I had gotten really tired of doing. if you get a veggie pan for use on the BBQ those tend to be cheaper, depending on where you get it. Hey there, I have been doing my frozen veggies this way for about three years now, and I really do love them roasted so much more than boiled or nuked. And while I love my mother with all my heart, her [canned] creamed asparagus was just blech! Fresh asparagus is so much better roasted with olive oil, salt, pepper, and garlic in the oven, and finished with some lemon juice at the very end. Another thing I like to do with fresh or frozen veggies [such as broccoli, zucchini, yellow squash, small carrots, cauliflower, white or button mushrooms] is to roast them in olive oil for oh, 15 minutes, and then mix some chopped fresh onion and garlic in [make sure to mix them in so they're coated and glistening] with the rest. Then I continue roasting until all is caramelized. After I take them out of the oven, I throw on some parmesan/romano/asiago mix cheese, toss together well, and then put them back into the oven for five minutes. I have known certain friends, notoriously reticent to eat veggies, to chow down on them when made this way. Enjoy! My wife suggested that the next time I make the Normandy blend this way to toss in parmesan cheese on top. Great idea! Thanks but I tried your recipe and the vegetables got burnt. I think 450F was too high. Do you know why this happened? She said 400 not 450. It said 400 to start and then crank it to 450 for the last 30 minutes. I had the same issue. I must have done something wrong, because 40 minutes burned the crap out of my veggies. I got a non contact thermometer at HF. It showed my oven running 35 degrees high. knowing this solved many problems. Made this! Added a bit of my touch to it. Took the frozen Normandy mix tossed it in two tablespoons of extra virgin Olive oil. Sprinkled in 1 teaspoon of "Simply Organic" brand Grilling Seasons Chicken over the veggies and mixed it in real well. I then placed all of the veggies on the cooling racks that we had. (I was wishing for a bbq veggie rack for this). Cooked as indicated in the original instructions. I removed the veggies from the oven when done, and put them into a glass bowl. I added sweet salted Butter on the top of the veggies while they were still hot and mixed it in. Served them in small bowls. Salted to taste. This was sooooo goood! I'm thinking of roasting more veggies instead of always steaming or stir frying. The ingredients of the Simply Organic Grilling seasoning for Chicken is as follows:(all ingredients are organic) Powdered garlic, sea salt, sage, onion powder, rosemary, thyme, oregano, marjoram, black pepper, fennel seed, coriander peppermint leaf, bay leaf. This way if you want to put together your own seasoning mix. The mixture of these herbs and spices makes a real difference in the flavor of the veggies during the roasting process. The combination of the smokiness and the seasoning really made this taste and smell awesome. Thanks for the original posting! 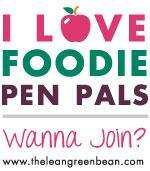 This will be added to my cooking repitoire!